A Ca' Nostra farmhouse - Benvenuti su terraetartufo! 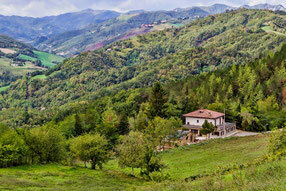 The Agriturismo A CA' NOSTRA is totally surrounded by forestland a typical example of mediterranean outback. Ample samples of small and big game animals can be encountered during the trekking excursions that our visitors can enjoy walking along the paths of the Cammino di San Vicinio of which A CA' NOSTRA is a resting and restoration point. The trekking trail 1B Ranchio-Pieve di Rivoschio runs right beside our site. We are also close to Sarsina an ancient roman center rich of history and arts which is only 13 km away. The Agriturismo can easily be reached by an asphalted road using a car or by walking a 1,2 km stroll from the center of Ranchio. Besides offering the opportunity of Bed and Breakfast accomodations The Agriturismo offers a Restaurant Service. Our guests can taste the wholesome and savoury meals of our traditional Romagna recipes, enriched by a touch of innovation due to the Chef's international travel experiences. Our meals are all prepared with first choice fresh ingredients from our territory. Be they home made Egg Pasta dishes, quality meats and poultry of certified origins, greens and vegetables from our garden or fruits from the surrounding orchards or our desserts that are all rigorously hand made from traditional recipies ( no industrial preparations find room in our kitchen), wildgame, mushrooms, black and white truffles that enhance our preparations so that our guests are assured of a tasting experience that they will enjoy and hardly forget. Last but not least lets not forget the selections of our fine local and regional wines, a must to accompany a fine meal. The Agriturismo has NO Architectural Barriers. That makes for easy access even for the guests that may have some physical impairments. Being able to speak fluent English, we can cater to the needs of a more international clientele. Looking forwards to greeting you here in Romagna, we the staff of Agriturismo A Cà Nostra thank you for your attention and wish you joy and happiness .